In 5-quart Dutch oven, heat 1 tablespoon of the oil over medium-high heat until hot. Add half the pork; cook 4 to 5 minutes, without moving, until browned and easily releases from the bottom. Turn and continue cooking 2 to 4 minutes or until browned. Transfer pork to 5- to 6-quart slow cooker; repeat with remaining pork. Reduce heat to medium; add remaining 1 tablespoon oil to Dutch oven. Add mushrooms, green onion whites and salt to Dutch oven. Cook 5 to 7 minutes, stirring frequently, until mushrooms release juices and turn brown. Stir in 1 tablespoon of the gingerroot and the garlic; cook 30 seconds. Cover and refrigerate remaining green onion greens and gingerroot until later. Slowly add broth, stirring and scraping to remove any brown bits from bottom. Transfer broth mixture to slow cooker with pork. Cover; cook on Low heat setting 8 to 10 hours or until pork is tender. Transfer pork to cutting board. With sharp knife, cut pork into bite-size chunks, removing and discarding any remaining fat. Using spoon, skim off and discard any fat from surface of broth. Return pork to slow cooker and stir in soy sauce and remaining 1 tablespoon gingerroot. Cover; cook 15 to 20 minutes or until heated through. Cook ramen noodles as directed on package; drain. To serve, divide noodles evenly among individual bowls. Ladle broth and pork over noodles, dividing evenly. Serve with remaining green onion greens; top each bowl with desired toppings. Shichimi togarashi is a great spice blend to serve with ramen. Commonly found throughout Japan as a table condiment, it adds nice spicy flavor when sprinkled over noodle dishes. Most blends include chiles, orange peel, seaweed, ginger, poppy seed and sesame seed and can be found at Asian markets or specialty spice stores. 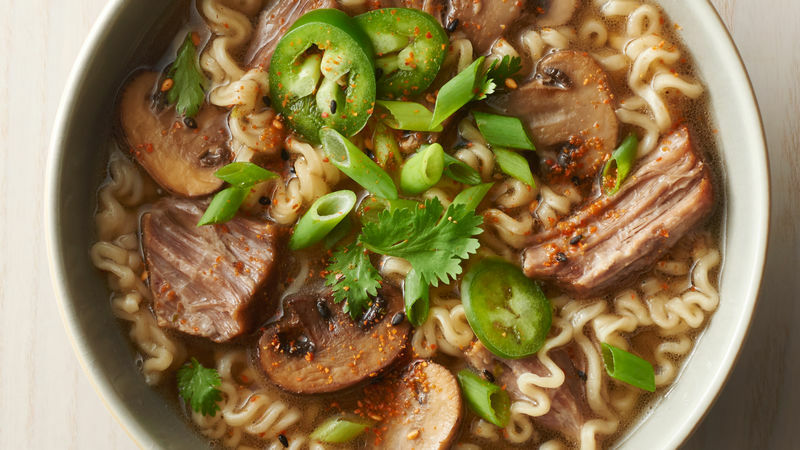 Other delicious toppings for ramen include boiled eggs, lime wedges, Sriracha, chili oil and sesame oil. Boneless pork shoulder is often sold in 3 1/2 to 4 lb. Ask the grocery butcher to cut to desired size since this recipe uses a smaller amount. Or, cut pork shoulder to desired size and freeze remaining portion for another use.